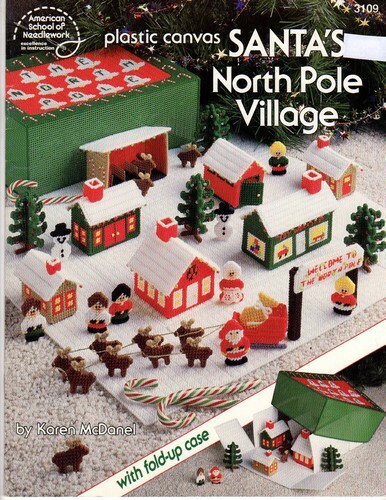 American School of Needlework Plastic Canvas Santa's North Pole Village plastic canvas pattern booklet. Karen McDanel. Base, Lid, Elf House, Christmas Tree, Post Office, Santa's House, Sleigh Shed, Toy Workshop, Welcome Sign, People, Sleigh and Eight Reindeer, Reindeer Barn. Appears new. Price tag on cover, store sticker inside cover margin. Out of print.